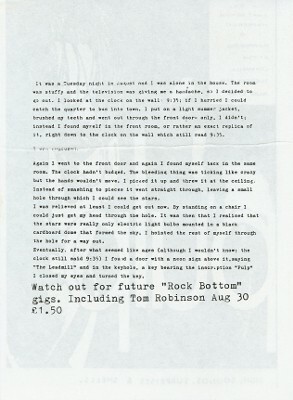 The text on the back of the flier has a concept similar to the words for the song This House Is Condemned. Concerts in the early Pulp-4 period were really something - the stage became a moonscape built with tin-foil and myself and friends projected slides and super-8 movies over the band. Russell called it "a multi media cosmic tangerine experience" ... and it was! 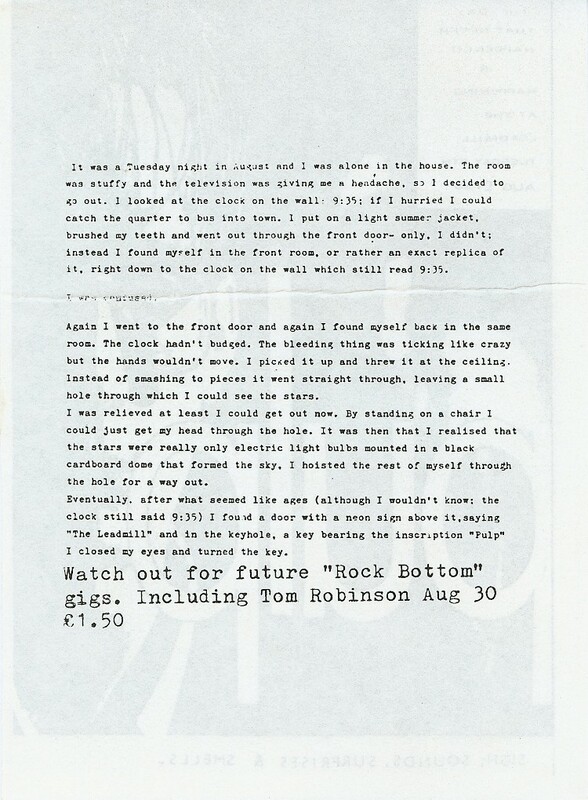 The stage decoration gradually got more and more elaborate and culminated in a kind of concept concert at the Leadmill called "The Day That Never Happened". This featured the usual films, slides and tin-foil, along with a few trees (sprayed white), dry ice (home made and very poor - it barely spilled over the saucer it was in), smells (Russell had made some charcoal incense, but of course the Leadmill is a big place so it didn't carry too well), video projection (but the projector broke and we made do with a television on stage), and the most sensitive moment was to be a snow fall during a slow ballad ... that ended up a total farce with people running around the stage carrying big hair-dryer things. So it didn't go smoothly and that was the end of stage decoration for a while because it was such a hassle getting it all together that the music ended up in the back seat. One person remembers that small glass bottles containing coloured liquid and decorated with Pulp labels and glitter were handed out by band members as people arrived. The concert was filmed and some of the footage was used for the Death Goes to the Disco video. Unfortunately, none of this has been released save for a few brief clips at the start of the Home Movies section of the 2002 Hits DVD. 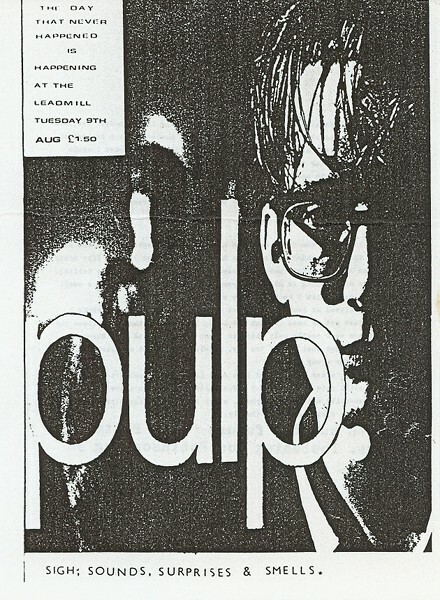 Some footage of this concert also appeared in the Pulp film Pulp: A Film About Life, Death & Supermarkets.